Our Mira Mesa office has been providing exceptional senior in-home care and customer service to the area for the past several years. With 24/7 accessibility, 24 Hour Home Care provides quality care that will allow an individual to age safely and happily in their own home. 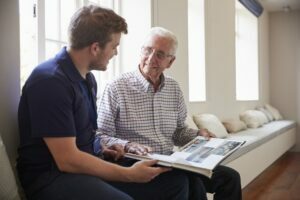 New clients receive the opportunity to schedule a complimentary in-home consultation where your care needs and situation will be thoroughly discussed. Are you searching for the best in-home care and senior caregivers Mira Mesa has to offer for your loved one? With a location in Carlsbad, 24 Hour Home Care is here to provide your loved one with the assistance they deserve, and your family some extra help may be much needed. We know that taking care of a senior loved one can be stressful, confusing, and sometimes frustrating. Servicing Mira Mesa for the past several years, our Office is here to provide your entire family with the peace of mind you are all looking for. Just voted again as the best home care agency in San Diego County, the Mira Mesa Office and its caregivers are dedicated to improving the life of your senior loved one and making your life easier. While conducting your loved one’s free in-home consultation, our team of highly trained care experts will develop a customized care plan based on your loved one’s health issues, personality, and overall preferences. By combining legendary customer service, the latest technology, and American innovation, our Mira Mesa location will provide your loved one with a level of home care that is unmatched. Make sure to call (760) 388-2231 to discuss your loved one’s situation and schedule your free consultation today!